2014 has been a mediocre year so far for Las Vegas based casinos, as revenue sank below similar values of 2013. Thousands of miles away, in Macau things are entirely different as casino revenues surged to new highs in the last couple of months. Everyone was anxiously waiting for the first-quarter results to be unveiled and their suspicions proved correct because the numbers were mind blowing. Land-based casino fans find anything they seek in Macau, a place where highrollers come together to compete on ridiculously high amounts. The reason for why these casinos grew out of proportions so quickly is that a lot of money has been poured into these projects. Many of the operators who have lucrative businesses in the United States have expended to this part of Asia and they now reap the benefits, as these casinos are more profitable than those back home. In the States, Sheldon Adelson and other casino moguls are trying to stop legislation that is favorable to online gambling, fearing that it would have a detrimental effect on their businesses. They go to great lengths to ensure the fact that legislators refrain from passing those laws that might one day allow Americans to play online without feeling the repercussions. 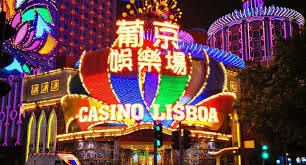 There are no such worries in Macau where the numbers are so encouraging that casino operators couldn’t care less about whether people play online as well, or not. The profits count into billions of dollars and the year is just half way through, so it is only fair to assume that the numbers will improve in the second half. Overall, the industry grew by a double-digit percent and this trend seems to be sustainable and it wouldn’t be excessive to project similar figures for 2015. This is one of the few industries where estimations are proven incorrect simply because reality exceeds expectations and the most optimistic scenarios suggest that this year the revenue will surge above $50 billion. A portion of these profits are generated by the luxury hotels and resorts here, but the vast majority of money is produced by casinos. In neighboring countries, such as Vietnam, American and European companies are testing the waters and discuss with local governments the possibility of opening similar gambling hubs. The authorities seem to be open to suggestions and in select locations huge casinos are already in the process of being built.